“Every three years AILA holds its International World Congress. This congress is the biggest event in Applied Linguistics, bringing together – usually more than 2,000 – researchers and practitioners from all areas of Applied Linguistics for five days. 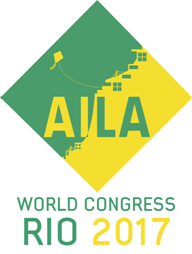 The first AILA Congress was held in France, in 1964, and in 2017 it will be in Rio de Janeiro, Brazil, organized by ALAB (Associação Brasileira de Linguística Aplicada). It is the first time the AILA Congress is held in South America. The journal Revista Brasileira de Linguística Aplicada will release, in 2017, a special issue whose theme is “ Innovation and Epistemological challenges in Applied Linguistics”, the same of the 18th AILA World Congress of Applied Linguistics – AILA – that will take place, in UFRJ, from July 23rd to 28th, 2017. Foreign researchers who would like to submit their papers may contact the journal directly through the e-mail rblasecretaria@gmail.com for further information.